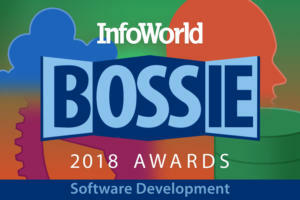 If you already have Windows 8 -- whether you were forced to buy it with a new computer, inherited it from a family member, coerced into it by your boss, or just love tapping those huggable live tiles -- upgrading to Windows 8.1 is a no-brainer. Lots of people think of Windows 8.1 as the version of Windows 8 that Microsoft should've shipped a year ago. They're not far from wrong. But before you move to Windows 8.1, make sure you understand the limitations and, uh, features on offer. Unpleasant surprises await the unwary. Problem: Microsoft would have you believe that its new Smart Search feature makes searching simpler. I think of Smart Search as the most intrusive, privacy-busting piece of Windows ever foisted on an unsuspecting public. If you leave Smart Search enabled, every time you perform a search on your desktop -- through files on your hard drive, or on your network -- Windows runs out to the Web and performs a Bing search on the same terms. 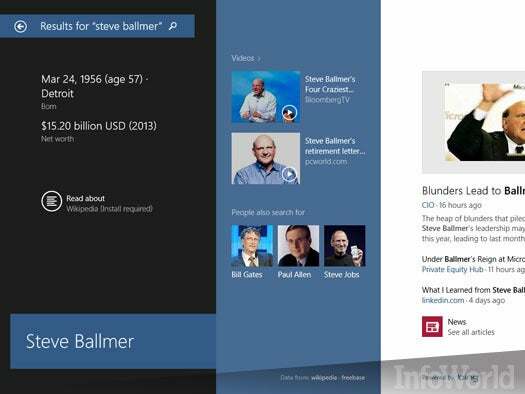 For example, if you search on your computer's hard drive for "Steve Ballmer," you get the "hero page" (Microsoft's term) shown here. Bing gets to keep track of all your local searches, and save those local search terms with your ID permanently attached. Solution: Although you won't be able to benefit from Smart Search's wonderfully cool offers to sell you things, turning off Smart Search should be the first goal of every new Windows 8.1 user. Unfortunately, there's no switch that says "Turn off Smart Search" or even a hint about what's happening from the Search pane itself. You have to know how to turn it off. To do so, bring up the Settings charm (Windows Key + C will do it), choose Change PC Settings. In the upper left, click or tap the back arrow until you can see Search and Apps in the list. Click or tap Search and Apps. Then turn off the switch marked Use Bing to Search Online. Problem: A Microsoft account is just an email address that's been registered with Microsoft. If you have a Hotmail, Outlook.com, or Live.com email address, you already have a Microsoft account. You can turn any email address into a Microsoft account. Microsoft wants you to log on to Windows 8.1 with a Microsoft account, so it can offer you all sorts of conveniences, such as automatic logon to SkyDrive and Metro Mail, Calendar and Internet Explorer, saving your Metro settings, and syncing your downloaded Metro apps. At the same time, you have to realize that Microsoft's keeping track of everything you do with the account -- when you log on to Windows, what you're doing with IE, and who knows what else. Solution: If you don't want Microsoft to follow you around like a sniffer dog in "Breaking Bad," create a new local account -- don't bother deleting any old accounts -- and use the new local account for your Windows efforts. When you create a new account (use Control Panel, which flips you to the Metro side), you may be greeted by a screen like this one, which tries to get you to sign into, or create, a new Microsoft account. To get a local account, click Create a New Account at the bottom, then click "Sign in without a Microsoft Account." Wade through the pushy messages and go local. Problem: If you know how to use Libraries -- mainstay of Win7/Win8 file organization, part of Windows Media Player since pterodactyl times -- you'll be surprised to learn that Windows 8.1 goes to great lengths to break and hide them. If you don't use Libraries, it would be worthwhile to see what you've been missing. Log onto Windows with a Microsoft account that was used in Windows 8, and your Libraries are intact. But if you use a new Microsoft account or log on with a Local account, your Libraries are all messed up: The Documents Library includes the \Documents and SkyDrive Documents folders, while the Pictures, Music, and Videos Libraries all lack the associated Public folders. 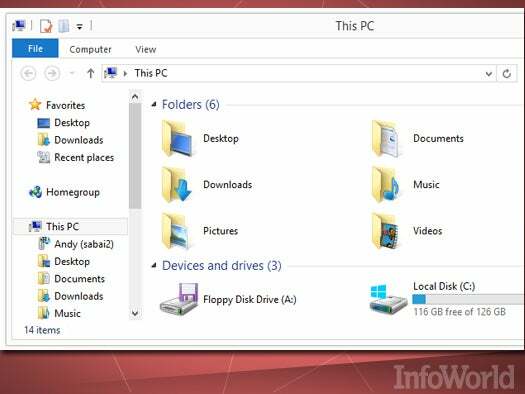 Solution: First, make Windows 8.1's File Explorer show you the Libraries: On the desktop, in File Explorer, click on the View tab; under the Navigation pane icon, check the item marked Show Libraries. Second, put the buried Public folder back in File Explorer's Favorites list: In File Explorer, navigate to C:\Users, then click and drag the Public folder to the top of the left side, dropping it in the Favorites list. Finally, rebuild your Libraries the way you want them. Navigate to a folder Microsoft would like you to forget -- for example, \Public\Public Documents, right-click on the folder and choose "Include in Library, Documents." Repeat for Music, Pictures, and Videos, at least. Problem: When I'm working on the old-fashioned desktop, I never, ever want to bring up the Metro Charms bar. None of the Charms work worth beans on the desktop. When I overshoot the X to close down a desktop program, my mouse invariably triggers the stupid Charms bar, which sits there until it decides it's tired of the game and finally disappears. The Charms bar isn't the only PITA Metro navigation "aid" that doesn't belong on the desktop. On the left side, the Metro task switcher occasionally shows up when I overshoot the upper-left corner of the desktop. Excuse me, but if I want to switch programs, I use Alt-Tab. Solution: To prevent the Charms bar from showing on the right and the Metro navigation thumbnails from showing on the left, you have to find this oddly hidden dialog box. On the old-fashioned desktop, right-click an empty spot on the taskbar and choose Properties. Then click the Navigation tab. To turn off the hot upper-right corner, uncheck the first box. To turn off the hot upper-left corner, uncheck the second box. The next slides discuss other options in this dialog box, which aren't as obvious as you might think. Solution: The Taskbar and Navigations Properties dialog in the preceding slide has an oddly worded option: "When I sign in or close all apps on a screen, go to the desktop instead of Start." If you check this box, every time you log on to Windows, Windows takes you to the old-fashioned desktop. That much is clear. What isn't so clear: If you exit all Metro apps -- by swiping each one down from the top of the screen -- Windows takes you to the desktop, too. However, if you shut down all of your running desktop apps, Windows doesn't do anything, it just sits on the desktop, as it would in Windows 7 or XP. Windows 8.1 gives you the option of showing this All Apps list instead of the Metro Start screen if you screw up and throw yourself into the Metro side of Windows. While the All Apps list won't win any Windows Start menu awards, on a mouse-centric desktop, it's better than all those live jumping bean Metro Start tiles. Use it. Problem: The Windows Experience Index is a handy tool for comparing machines side by side, and taken with copious quantities of salt, it gives a naïve assessment of relative performance. I'd never take the WEI as gospel, but it's easy to fire up WEI when you're looking at a dozen different machines and want to know if there are any real winners or losers in the bunch. Microsoft killed the WEI in Windows 8.1, though it's alive and well in Windows 8. "Killed" is a bit of a misnomer. In fact, Windows still runs the WinSAT assessment tools under the covers, but it doesn't display the results of the WinSAT runs. Solution: I've found at least one program that claims to calculate and show the WEI in Windows 8.1, but I couldn't get it to work. Until somebody sticks a graphical front end onto the numbers, you'll have to run it manually. That's easy. When the command finishes, use File Explorer to navigate to C:\Windows\Performance\WinSAT\DataStore. Right-click on the Formal.Assessment file (at the bottom of the list) and choose Open With, Internet Explorer. You see the text assessments shown in this slide. The numbers map directly onto the scores reported in Windows 8. No mention of Windows 8.1's shortcomings (or Windows 8's, for that matter) would be complete without a resounding endorsement of the many good, solid third-party Start menu replacement programs currently available. My personal bias: Start8, by Stardock. It puts a full-featured, better-than-Windows-7 Start menu on your Windows 8.1 old-fashioned desktop, and it adds easy hooks into those Metro apps that you'll probably never use or want. Bring your sanity back for $5. While you're on the site, make sure you also look at ModernMix, which lets you run Metro apps on the old-fashioned desktop -- very cool stuff. 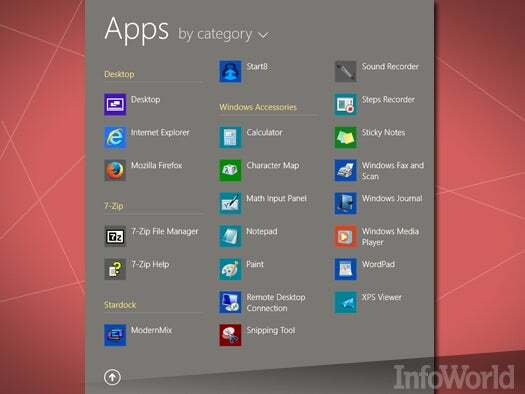 If you follow all of these steps, you'll put a big dent in the damage done by Windows 8.1. But there's more you can do. First, go through my slideshow "The desktop lover's guide to supercharging Windows 8.1," which dives into detail about setting up the All Apps list in a more manageable light. 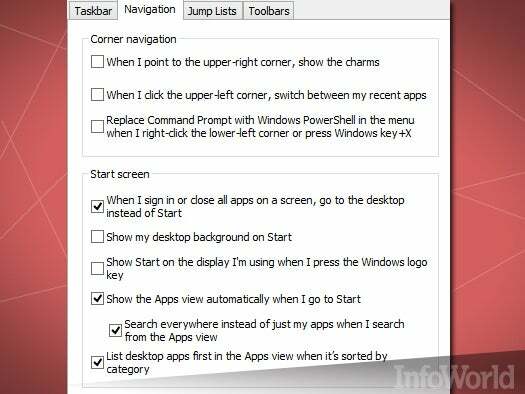 It also takes you through ways to load your old-fashioned desktop's Taskbar. Then, take a look at "Minimize Metro! How to make Windows pure again," for details on replacement programs you could and should use to avoid those jarring trips into Metro land. Woody's acclaimed "Windows 8.1 All-in-One for Dummies" landed on store shelves in October.